Incorporate the Canada Learning Bond Into Your Website For Great Results! 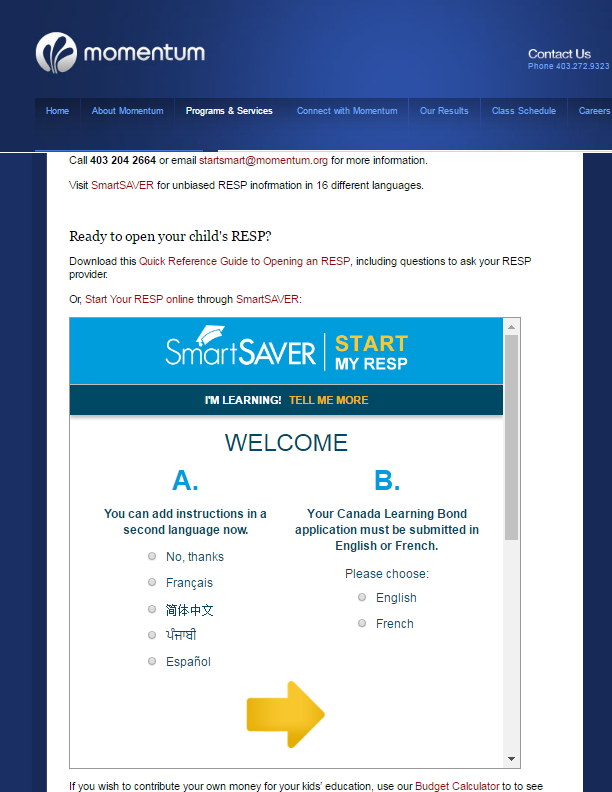 To simplify access to our online RESP starter and Canada Learning Bond (CLB) application, a number of our partners have created their own CLB web pages and are embedding the application directly into their own websites. Embedding the application on your website not only cuts down on the number of steps a family must take to access the application, but also allows them to complete the process without leaving your website. It’s a great way to capitalize on the web traffic your organization’s website already receives and offers one more tool to encourage people to visit your website. Partners who have launched their own CLB webpage have seen up to a threefold increase in the number of parents who are completing applications compared to sending them to SmartSAVER.org directly. The key to this success is trust! Families already access your website for trusted information. By placing information about the CLB with a link to the application on your website, you show the families who trust you that you trust SmartSAVER. When your custom web page indicates that RESPs and the CLB can be accessed for free through the online application, parents will believe it. 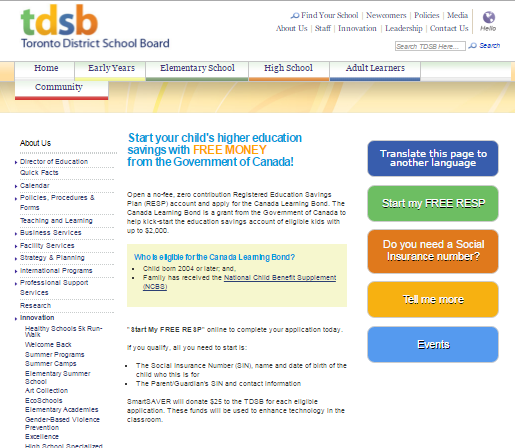 The TDSB used our template to create their own RESP and CLB webpage. Accessed through their own website at www.tdsb.on.ca/SmartSAVER , this provides TDSB parents with a warm introduction to the application process along with the most important information they need to get started. When visitors click the green ‘Start My FREE RESP’ button, a unique URL tracks the completed applications sent from their page. Our webpage template is available in PSD format. You can adapt it to your organization’s web layout, colours and add details relevant to your campaign or audience. Momentum Calgary used SmartSAVER’s simple iFrame code to embed the CLB application directly into their own website www.momentum.org/startsmart . This allows visitors to complete the application without ever leaving Momentum’s website. Request SmartSAVER’s iFrame code for your organization! Applications generated by your organization can be tracked using a unique URL. Not ready to create a CLB page? Add one of our promotional buttons to your organization’s homepage. This will help ensure the visitors to your site are encouraged to learn more about RESPs and apply for the CLB. The buttons are available in different sizes. Request one from SmartSAVER today. Here are some more examples of unique CLB webpages!